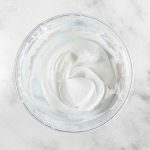 Whipped coconut milk is creamy, rich and thick, much like traditional whipped cream and the coconut flavor is very faintly there. Not nearly what you would expect it to be. Coconut whipped cream is great for topping desserts like pancakes or hot chocolate. The coconut fat doesn’t separate from the water. The cream is grainy no matter how long and hard you whip it. The coconut whipped cream isn’t as rich and doesn’t always form as stiff peaks quite as well as traditional whipped cream. Not doing much to sell this am I? It tastes great, looks wonderful, and is good for you. But I don’t want anyone getting frustrated. There are two ways you can make coconut whipped cream. You can either use a canned full-fat coconut milk or pure coconut cream. Full-fat – since whipped cream is, well, fat, you absolutely need to use full-fat coconut milk. 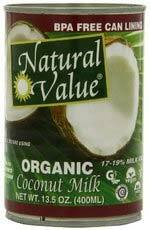 Light or reduced fat coconut milk won’t work because it’s just watered down full-fat coconut milk. Without emulsifiers – emulsifiers are chemical additives that make it possible for water and oil to become finely dispersed in each other, creating homogeneous emulsion. If your coconut milk contains emulsifiers, it’s unlikely that the coconut milk will separate into a thick coconut cream and the watery component. 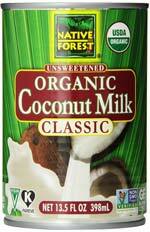 Common coconut milk emulsifiers include guar gum, carrageenan, and methyl cellulose. So look for a brand that doesn’t contain emulsifiers. Better yet, look for a brand that only has two ingredients – coconut and water. Without too much air – pick up a can of coconut milk and give it a gentle shake. According to Ashlae from Oh Lady Cakes, if you can hear the liquid sloshing around, put it back on the shelf (it has too much air in it). Try to find a can that has only a small pocket of air, making a soft gurgley sound. In my opinion, it’s even better if you hear nothing, because that’s a good sign that the coconut milk is already somewhat separated. Coconut cream – some brands are now starting to carry pure coconut cream. It’s basically an entire can of solid coconut cream. A can of coconut cream is usually equivalent to the cream from two cans of coconut milk. (Note: contrary to popular belief, all coconut cream contains water and needs to be refrigerated for making coconut whipped cream). of coconut milk in the fridge overnight. I like to keep at least a couple cans in the back of my fridge just in case I need a quick whipped cream for a recipe. Then I always have it on hand and don’t have to wait overnight to use it. Once your can has been refrigerated, remove it from the fridge and open the can (be careful not to shake the can). The thick/solid coconut cream should have separated to the top, while the coconut water is on the bottom. 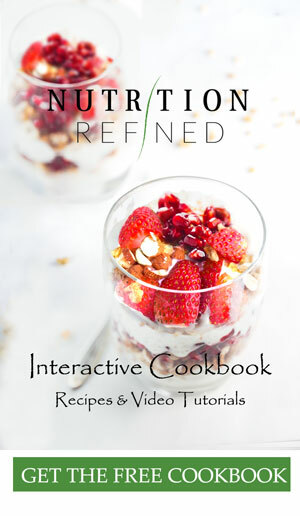 Using a spoon, scoop out the coconut cream, and use the coconut water for a different recipe. The coconut cream is what you’ll use to make the whipped cream. If you accidentally mix some of the coconut water with the cream, you can add tapioca flour, one teaspoon at a time, to thicken the cream up. Try to keep the coconut cream as cold as possible. So chill your mixing bowl (if using glass or metal) for about 5 minutes before whipping up the coconut cream. This step isn’t a deal breaker, but it helps. To whip the cream you can use a stand mixer or a hand mixer (not a blender or a food processor!). The faster it whips, the better. It’ll take 3-4 minutes till the cream becomes light and fluffy. Beating the cream for longer than 5 minutes won’t make it firmer. It actually seems to deflate it a bit. So don’t overdo it. 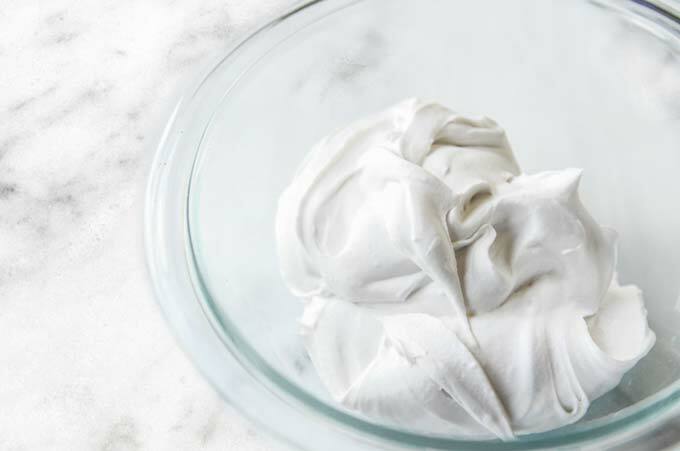 Using the coconut whipped cream immediately is always your best bet but if you’re getting ready for a party or just like to batch cook everything in one day, coconut whipped cream can certainly be stored and used later. You can store any leftover cream in the fridge in a sealed container for up to one week. It will go a little hard in the fridge so you may need to whip it again. Also, I find that coconut whipped cream—just like regular whipped cream—doesn’t hold up great in the heat. So if you’re using it as frosting, either frost right before serving or keep whatever is frosted in the fridge. Some brands of coconut milk whip up better than others. However, sometimes even the brands I recommend (and use all the time) flop. Sometimes the companies change their formulas, sometimes there’s an odd can that just doesn’t work. Don’t let this deter you from trying your own coconut whipped cream! Now, onto the individual brands. Ingredients: (organic) coconut, water, guar gum. 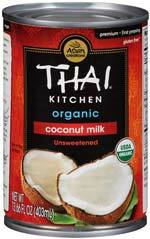 Product notes: Thai Kitchen sells both organic and non-organic full-fat coconut milk. I’ve tried both with exactly the same results. Thai Kitchen actually used to be my go-to brand for canned coconut milk until I found out that it’s packaged in a BPA can. Unfortunately, they have no desire to change their cans so I no longer use it. Whipped cream: the cream always separates perfectly. 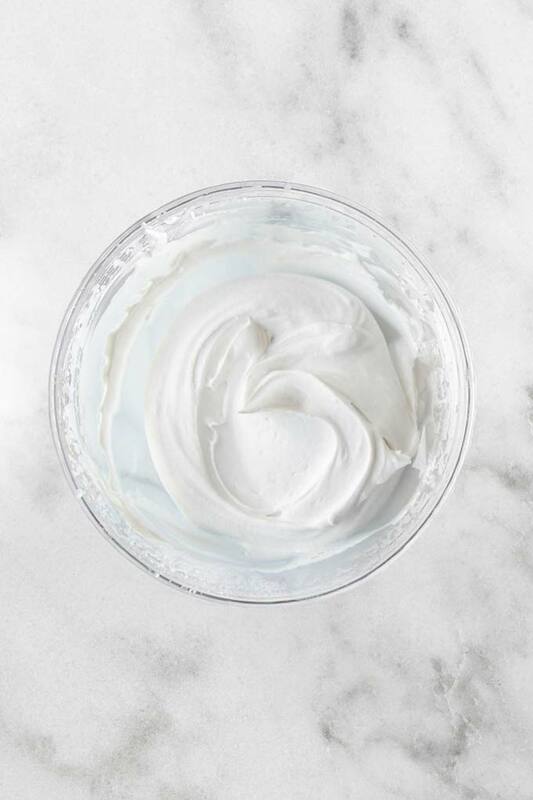 Once whipped, the cream is light, creamy, smooth, and bright white in color. It’s very easy to pipe and holds it shape pretty nicely. Ingredients: organic coconut, purified water, organic guar gum. Product notes: I’ve only used this brand twice and it always worked for me. However, I know many of my friends are having trouble with it. Apparently, sometimes it doesn’t separate properly (the cream is very thin and not waxy), sometimes it curdles … so I don’t think this brand is the most reliable. Whipped cream: the coconut cream whipped up into soft peaks that held their shape. However, the whipped cream wasn’t as thick and creamy as the one from Thai Kitchen. Ingredients: organic coconut, water, organic guar gum. Product notes: I know there are people who swear by this brand. I used it in the past and didn’t find it consistent at all. Some cans would separate, others would not. I’ve read that the quality depends on where the product is sourced. The milk sourced from Thailand typically separates. while the milk sourced from Sri Lanka does not. Whipped cream: doesn’t usually whip up since it’s usually nearly impossible to separate the cream from the water. Product notes: after I found out that Thai Kitchen contains BPA, I switched to this brand. It’s made in Philippines, but it’s fair-trade. Whipped cream: whips up perfectly every single time. It’s not quite as smooth as Thai Kitchen, but that’s because this coconut cream doesn’t contain any additives. It’s not perfectly white either. but it tastes great. 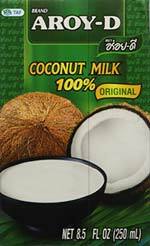 Product notes: the Aroy-D coconut milk from Thailand comes either in a can or in a vacuum box. The cans can be quite confusing because they have different percentages of coconut – anywhere between 55% and 65%. The cans also contain guar gum and potassium metabisulfite so I stay away from them. The boxed coconut milk seems pure. Whipped cream: whips up really easily, it is tad on the grainy side (again, probably because the boxed version has no additives). It had a really pleasant coconut flavor though. 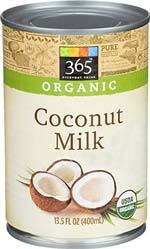 You might be wondering about other popular coconut milk brands, such as Goya and Chaokoh. I don’t recommend either because they both contain sulfites and are packaged in BPA-lined cans. Product notes: since the whole can is coconut cream, there’s no separation. You can scoop out the whole thing and whip it. 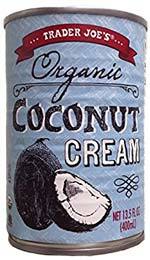 I never used to be a big fan of Trader Joe’s coconut cream because they didn’t have an organic option and the coconut cream contained sodium carboxy methyl cellulose and xanthan gum. However, a few months ago they changed their supplier. Their new coconut cream from Sri Lanka is organic and contains no additives. Whipped cream: whips up really nicely. The coconut cream is very thick, sturdy, and has a nice light color. The taste is very natural since it has no additives. Chill your coconut milk (or coconut cream) overnight or for at least 12 hours in the fridge, ideally for 24 hours. This will encourage the separation of the coconut cream and coconut water, Be sure not to shake the can. About 1 hour before making the coconut whip, chill a mixing bowl in the freezer. Then open the chilled can of coconut milk (or coconut cream) and scoop out the cream that is on top. Reserve the liquid for other recipes. . Using an electric hand mixer or a stand mixer with the whisk attachment, beat the cream until fluffy and smooth. Add in sweetener to taste and vanilla. Use immediately. Store leftover whipped cream covered in the refrigerator for 1-2 weeks. The whipped cream will harder and set in the refrigerator. Allow it to sit at room temperature until it softens slightly and re-whip it as needed. * You can find out which brands I recommend in the "Brands of Coconut Milk & Coconut Cream" section of this post. Thank you for this detailed comparison. This was very helpful. I appreciate the pictures of the cans and additional details on your results. Have you had success with trader joes new organic coconut cream? Never had this problem with the non organic one. I tried putting it in the blender but it separated. Sorry. Typos from typing on my phone. I noticed you said not to use brands with emulsifiers like guar gum – but you also said Thai Kitchen used to be your go-to (bpa being the reason for switching). It definitely contains guar gum, so did it still work for you? Hi Ashley – a great question! Yes, Thai kitchen does contain guar gum, and it is a hit-and-miss with that brand. I would say that it separates 50-75% of the time. So, not very consistent. If you wanna go with that brand, make sure you purchase the full-fat (not light) version and give it a little shake to see if you can hear any sloshing.